With this year’s auction season now well underway, we have already seen quite a few remarkable, bizarre, and exceedingly rare watches come across the auction block, with a number of them selling for well above the six-figure price point. Sotheby’s New York will be hosting their Important Watches auction today, and as expected, a variety of truly exceptional timepieces are being offered up for sale to the highest bidder. The list of noteworthy offerings is diverse and extensive; however here are a few lots that will almost certainly have the attention of more than a few collectors, and will likely pull in significant sums when the final hammer falls. The reference 8171, often referred to as the “Padellone” (Italian for large frying pan), is considered by many collectors to be one of the most unique and highly sought-after vintage Rolex watches currently on the market. Manufactured for only three years between 1949 and 1952, only a small handful of reference 8171 watches were ever produced, and it is one of only two vintage Rolex references to feature a moonphase complication; the other being the reference 6062. This particular reference 8171 that Sotheby’s is offering as “Lot 78” is in exceptional condition. The dial is unrestored and only has minimal blemishes, the case is crisp and in unpolished condition, and the engravings on its snap-on case back still remain crisp and legible. Sotheby’s has the pre-sale estimate listed as $100,000 to $200,000; however a very special reference 8171 with a diamond-set dial broke the million-dollar mark at Christie’s New York back in 2013, so this is definitely a lot that has the potential to surprise. According to Sotheby’s, only four Patek Philippe watches with 8-day movements (not including modern production models) are known to exist. There have been two other examples of vintage Patek Philippe wristwatches with 8-day movements that have made it to market; however both previous examples had had their cases previously replaced. 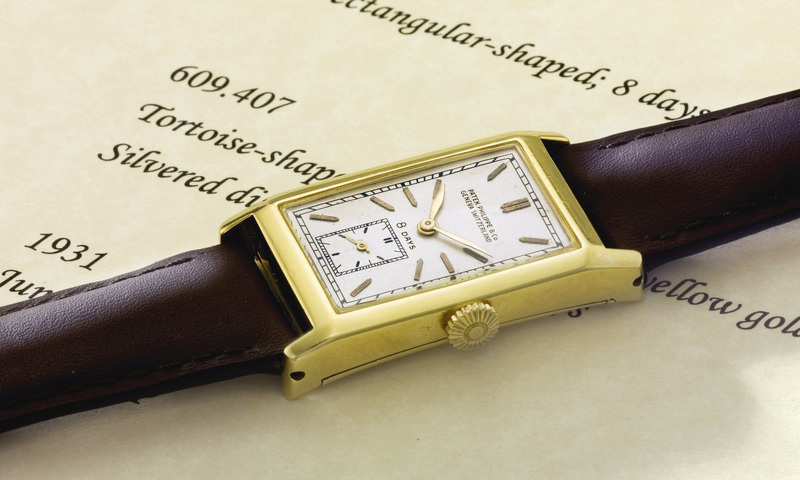 This particular watch, which dates back to 1931, is the only known example to have survived in its original case, and carries with it a movement of number of 198450. A case-back engraving on the watch from 1934 notates the location of Beverly Hills, California – an interesting detail, given that the other two, vintage 8-day Patek Philippe watches were originally retailed by Brocks & Company in Los Angeles. 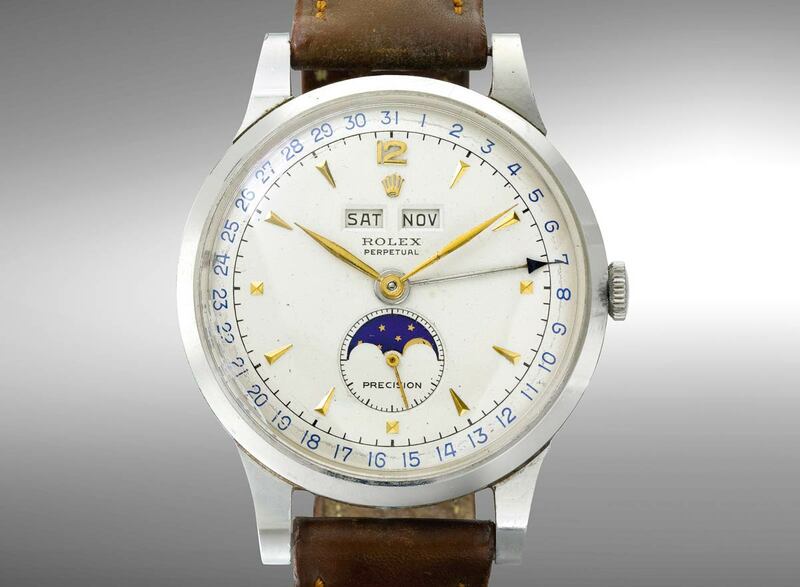 Sotheby’s has the pre-sale estimate for this incredibly rare wristwatch listed as $150,000 to $250,000. Included with the watch is an official Patek Philippe Extract from the Archives, which confirms the original date of sale of June 21, 1932. While the watch isn’t expected to break records like the Paul Newman Daytona, this watch will still recieve a fairly high bid. Another noteworthy Rolex triple calendar that Sotheby’s New York will be auctioning in the coming days is a reference 5036 “Jean-Claude Killy” triple calendar chronograph in rose gold. The reference 5036 is the third generation of Rolex triple date chronograph watches from their Dato-Compax series. Manufactured for only a short while between 1948 and 1951, only about fifty reference 5036 watches were manufactured in pink gold, with only four examples known to the market. This particular reference 5036 dates back to 1953, and while the dial shows some signs of light aging, the 18k pink gold case (manufactured by Spillmann SA in La Chaux de Fonds) is still nice and thick, and has retained much of its rose-tinted coloration. 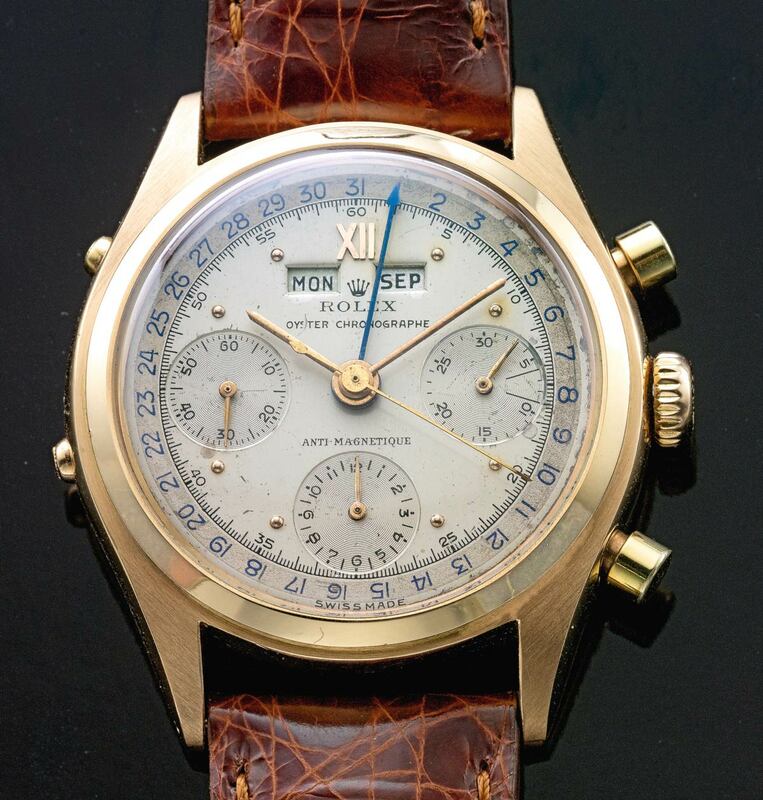 Sotheby’s has the pre-sale estimate for this exceptionally rare and complicated wristwatch listed as $200,000 to $300,000, which serves a subtle reminder to the collecting world that the Paul Newman Daytona is not the only Rolex chronograph that routinely sells for prices that reach well into the six-figure territory.